Greetings! Hoping that the 6 more weeks of Spring predicted back in February are just about done in your home area. Here in the Pacific Northwest, we have had snow and it is still rather wet and blustery outside. Things for Thread Therapy are moving along quickly this month as Rachel and I prepare for our spring calendar which includes lots of BIG vending opportunities. We will be at the International Quilt Festival Chicago in April, and both the Common Threads Regional Show in Wichita and the 2018 Quilt Show by Green Country Quilters Guild in Tulsa in June. We hope we will see you at some of them in the future. We have been busy ordering TONS, literally, of fun beautiful fabrics. So you should check out the shop! Our website was revamped in January this year and is looking M-A-R-V-E-L-O-U-S thanks to Rachel's work. In addition – Rachel and I have been working on samples for theses shows. Rachel has been having fun playing with the new line for Tula Pink and I have been working on a Laura Heine collage quilt. Being that we have been so busy sewing – I started collecting tips from some of the quilting groups I'm in. I put out a simple request and was bombarded with hundreds of tips from ALL over our great country. I've sorted through them and this month I'm sending you my favourite ones. Enjoy and get quilting! Tips from the Best Quilters...just like you & me. Always check website for pattern designer or magazine pattern errata corrections before buying or cutting into your fabric choices. Mark date on rotary blade with a Sharpie marker when you change out blade. Use safety pins to hold the binding in place for hand sewing. Did you know if you stick your finger with a pin or needle you can put Carmex on it and it will take the pain away. I use a belt holder to hold my smaller rulers and templates. Ziploc bags are the best organization tool. I punch holes in them and put them in a ring. Share your sewing talent, there is always someone that wants to know how to sew or quilt. Fill several bobbins before you start. I use a clean toilet brush to pick up threads off of the carpet. Take a class every now and then just for the inspiration of it. One finished quilt that contains a few goofs is better than 10 magnificent UFOs. I save the cardboard from fat quarters to wrap my bindings on. Sewing is art. There is no right or wrong. Each piece is unique & beautiful in it's own way. Enjoy the adventure. Happy sewing. I use an 8 lb. kettle ball to hold the end of my rulers when I cut fabric. It has a flat bottom and a handle so that makes it easy to use and it works on most any size ruler. Buy a good seam ripper. I don’t use a ripper - I use my olfa cutter- much faster. Starch and press fabric before cutting. It helps with accuracy. Let go of perfection. You don't always have to follow the rules. Let your creativity flow and have fun. 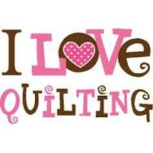 Let quilt making your form of therapy/meditation. If you hand quilt and have a hard time threading the needle hold the needle over a piece of white cloth it's easier to see the eye. Try wetting the needle instead of the thread. Works for me! If you worked hard on it, it's good. Have more than 1 crock pot. If you have main meals ready you also have leftovers! My family can always tell I am working on a large project by the crock cooking on the counter. I dont have to stop to cook dinner for days-just throw a salad together! Marry a rich man, LOL! Thank you to all who responded - I'll save those I didn't pick this time for another time. These are all great tips and great advice about the quilting state of mind. Had fun giggling with a few too.